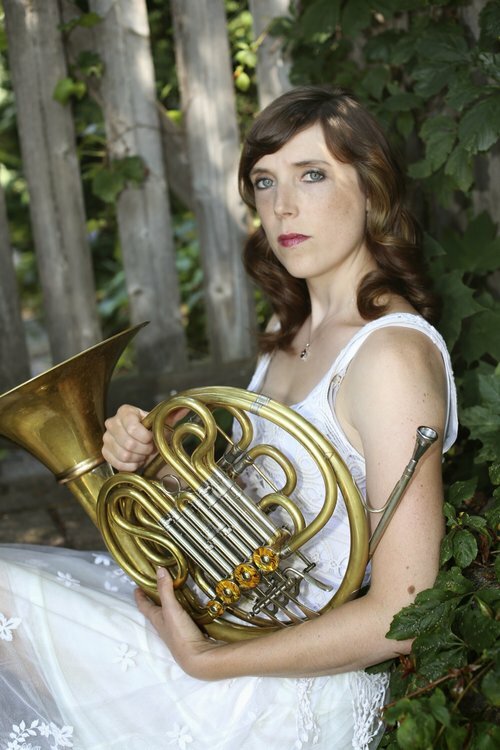 Hazel Dean Davis is an American orchestral hornist living in Boston. She plays regularly with the Boston Symphony Orchestra and Pops, and the Grammy nominated chamber orchestra, A Far Cry. In 2018 Hazel made her Boston solo debut in Britten’s Serenade for Tenor Horn and Strings with tenor Nicholas Phan and A Far Cry, for which critics celebrated her “masterful colorings and sensitivity to text” (BMIntelligencer). Other recent and upcoming highlights include 2018-19 Boston Pops tours of the East Coast, California, Texas and Florida; a 2017 tour of China and Taiwan with the Cincinnati Symphony and Pops; a 2016 double-horn recital with Cincinnati Principal Elizabeth Freimuth and a 2017 solo recital at University of New Hampshire; ten weeks of the 2015-16 season with the Boston Symphony Orchestra, including their Carnegie Hall Tour; two weeks with the San Francisco Symphony; a Carnegie Hall Tour with the Baltimore Symphony; premiering Matthew Aucoin’s opera “Crossing” at the American Repertory Theatre in Cambridge in 2015 and at the Brooklyn Academy of Music in 2017; as well as concerts with Rhode Island Philharmonic, Portland Symphony, Boston Ballet, Boston Philharmonic and the Boston Modern Orchestra Project. Hazel appears on the Boston Symphony’s 2016 Grammy winning recording of Shostakovich Symphony 5, and can be heard on the BSO’s 2017 recording of Strauss’s Alpine Symphony. Prior to her move to Boston, Hazel played second and fourth horn with the Virginia Symphony Orchestra for 11 years, a job she won at age 22. Originally from St. Paul, Minnesota, Hazel graduated from Harvard University in 2003 with a BA in Biological and Social Anthropology. At Harvard, she studied horn with James Sommerville and was active in the chamber and orchestral music scene, receiving both the David McCord Prize for Music and the Louis Sudler Top Senior Prize in the Arts. In addition to Mr. Sommerville, Hazel studied with Caroline Lemen and Kendall Betts in St. Paul, and with Julie Landsman at The Juilliard School, where she received a Graduate Performance Diploma in 2004. Hazel spent two summers as a Tanglewood fellow when she was aged 20 and 21. She also enjoyed summers at the Marlboro Chamber Music Festival, the Pacific Music Festival, and the Aspen Music Festival. A passionate chamber musician, Hazel has been featured in the Virginia Arts Festival Chamber Series, where critics called her “the star of the show…she played with complete security and authority…whether asked for leaps, trills, or long beautiful sustained notes” (Virginian Pilot). Hazel is on faculty at the Longy School of Music in Cambridge, and is the horn professor at the University of New Hampshire. She spends her summers as a faculty artist and teacher at the Brevard Music Center in North Carolina. She also maintains a private horn studio in Arlington, MA. Hazel lives with her husband Steve, children Diana, Nadia, and Kalle, Sophie-Cat and Piper the puppy. When not playing horn, you will find Hazel running around the Arlington reservoir, sipping coffee and reading novels at her favorite coffee shops, making granola, marching for minority and women’s rights, reading up on the latest discoveries in human evolution, and playing board games or crafting with her kids. Her friends tease her for loving everything local, and indeed Hazel loves little more than a day spent exploring farmers markets, neighborhood cafes and small shops. She enjoys traveling and immersing herself in the “local” food, culture, and neighborhoods of wherever she is. She has spent time living in Norway, Sweden, and France, and has traveled extensively throughout the USA, Europe, Asia, and South America.